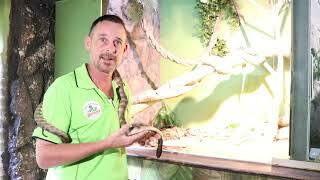 Jet joins the team at the Daintree Discovery Centre. While most fruits you find in the rainforest are highly toxic, there are some that can be eaten, just like this Davidson Plum. 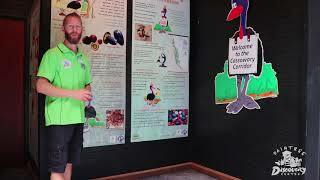 CAUTION: The Daintree Discovery Centre advises against eating any fruits found in the rainforest. 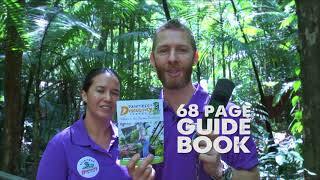 The rainforest isn't always green, find out more! 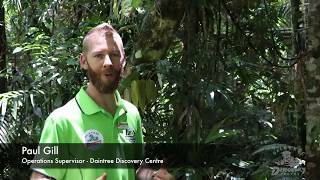 When the Daintree Discovery Centre's interpretive centre was built, great care was taken to protect the natural environment, including building around the big trees! Masters of camouflage, you won't spot these guys in the rainforest. 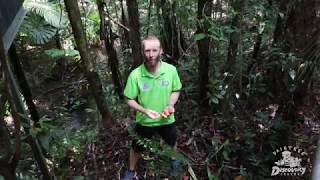 Ever seen a brightly coloured fruit on the rainforest floor and wondered what it is and whether it is edible? 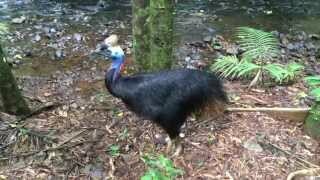 Chances are, it is not, and the only thing that should be eating it, is a cassowary! 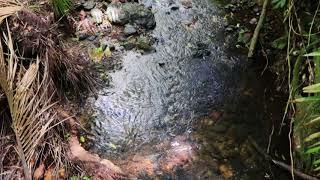 McLean's Creek runs through the very heart of the Daintree Discovery Centre and is an abundant and diverse source of life. 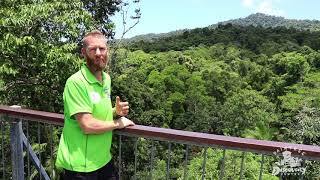 How many steps does it take to get to the top of the 23 metre high Canopy Tower at the Daintree Discovery Centre? 112 to be exact, but it is well worth the effort, with views for miles and the sound of some of our most beautiful songbirds. The Spiny Rainforest Katydid is a very unusual rainforest katydid. The body and legs have numerous thorny spines and antennae are very long. The insect is greenish above with different shades of green and brownish colours providing excellent camouflage; the underside is pale. 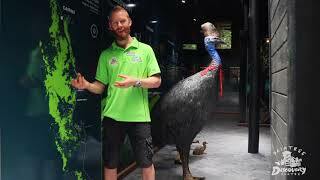 With royal blue necks and shaggy, jet-black feathers, cassowaries look like no other birds on planet earth. They are what is known as a keystone species, responsible for literally helping to grow our very precious Daintree Rainforest. 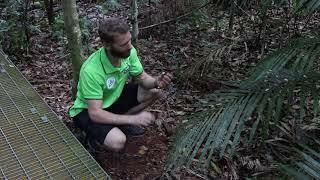 Ever seen an Australian Tarantula hunt its prey? 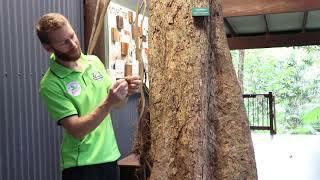 Meet Nora, she joined our Daintree Discovery Centre bug family five months ago. She has settled in very well, and some days she even shows us her hunting prowess. 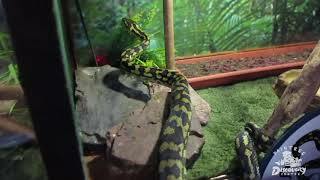 Yasi was an absolutely beautiful snake, who was equally adored by staff and visitors. 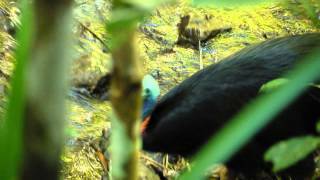 Our proud resident male Cassowary with one of his first chicks. Amazing to see they way he imitates his father! 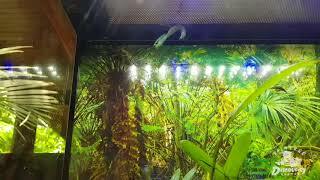 This male featured in one of our earlier videos "Breeding Pair" and it is great to see the fruits of his labor with this sprightly little chick following him around. 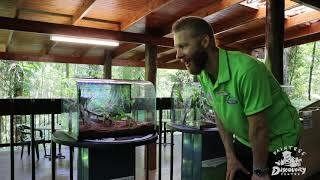 Sean performing at the Daintree Discovery Centre. 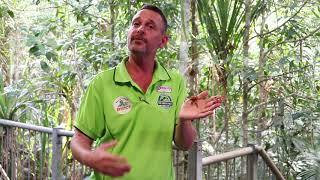 We are delighted to have Sean as part of our permanent family at the Daintree Discovery Centre! 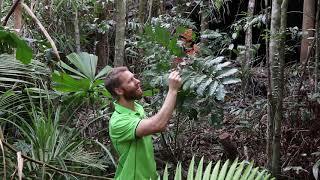 Come on a spiritual Journey filled with lots of laughs as Sean Presents the cultural side of Rainforest history. 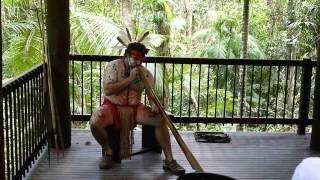 Featuring Didgeridoo, Dance, Artefact presentations, didgeridoo participation, Fire making and story-telling!